– Albert Einstein once said: “The measure of intelligence is the ability to change.” Changing your mind is an art, there are very few absolutes in the universe and if you have an opinion on something, but the evidence shows the opposite, you have to change your mind. It is a noble humble act, the opposite to being stubborn. Something old changes to something new. Unfortunately, old stuff resists to change as we can see in politics, business, university and society in general. Of course nutrition is not an exception, and it is plenty of myths that science is slowly demystifying, e.g. the food pyramid, you should avoid fat to loose weight, sugar is the brain’s fuel, breakfast is the most important meal of the day,.. it is hard to debunk dogmas, but intermediate fasting its getting more and more attention among the scientific community, it is not just my personal opinion. Here we will see some studies about it that will hopefully encourage you to try it. When we eat, glucose excess is first stored as glycogen in liver and muscles. Glycogen is a polymer of glucose molecules that can be accessed easily. Energy from fat is the second source as Fat takes longer to catabolize. When we fast for around 12 hours, glycogen deposits deplete and the pancreas orders to start burning fat. The use of fatty acids produces ketone bodies (ketones are molecules with an intramolecular C=O bond) that are used as energy by brain and muscles. That’s the reason why when we wake up after fasting for 12 hours or more our breath and our urine smell like acetone, the most volatile of the three ketone bodies. Many benefits of ketosis have been described, it has been the treatment for headaches, neurodegenerative disorders, autism, bipolar disorder and brain tumors. 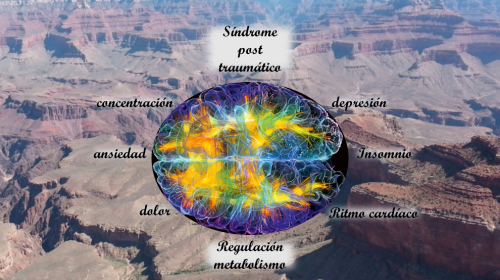 The body enter a moderate stress that forces it to activate defense mechanisms. For example, this study shows how in ketosis, mitochondria are multiplied, energy production is optimized and high energy demanding situations are better handled. Intermediate fasting is related to ketogenic diets like Atkins. Fatty acid proportion is increased compared to carbohydrates, the body works just on ketone bodies. 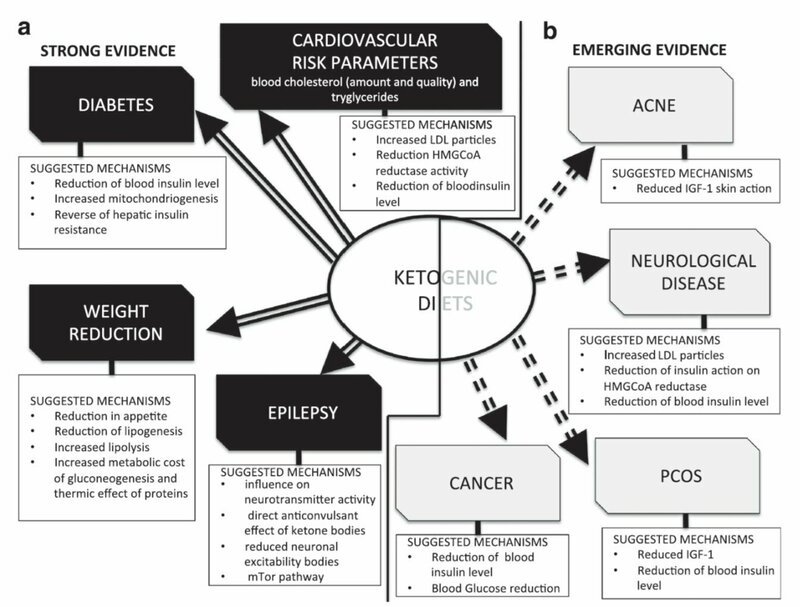 In Nature’s journal European Journal of Clinical Nutrition authors reviewed studies advocating for ketogenic diets. They classified and graded the studies published according to the evidence strength. There is strong evidence that ketones may help us to deal with weight reduction, epilepsy, diabetes and cardiovascular diseases, and they might also help with acne cancer and other neurological diseases. Should we eat as much fat as we want? There are different opinions, I think there is never agreement in nutrition, I think it is healthy to eat mono and poly unsaturated fat but it it not healthy to eat trans or saturated fats (soon a post about this topic). Intermediate fasting is also related to calorie restriction, probably some of you already found the connection. According to some studies calorie restriction would delay aging. The sirtuins are the protein’s family which modulate aging effects like reactive oxygen species accumulation or protein unfold. As an example look at the monkeys in this screen capture. Sandrine Thuret, from King’s College at London, explains how neurogenesis in the hippocampus is favored by sport, resveratrol, intermediate fasting and omega 3 fatty acids. In her own words: “Intermediate fasting boosts your memory”. Bert Herring M.D, creator of Fast-5 and D.I.E.T. explains how to do intermediate fasting. 5+2. It consists on reducing your calorie intake during two days a week to just 500 kcal. The rest five days you can eat normally, around 280 kcal/day (depending on your daily routine). I personally find it a tough way since it has a weekly routine, not daily, what requires longer effort to get used to it. Morning Fasting. As Prof. M. Matson and I personally do, you just need to combine your sleeping time with omitting breakfast. This way you will get more than 12 hours fast, you will deplete your glycogen deposits and will enter in ketosis for several hours. It might look tough, but you can trick your stomach with some coffee in the morning, no milk, no sugar. Try it and you will forget the breakfast myth. 16:8. As Hugh Jackman explains, Dwayne “The Rock” Johnson recommended him this method in order to boost your energy and burn fat. Of course you need to adjust your diet if you want to gain volume or just keep healthy. Do not mix nutrition ketosis with diabetic ketoacidosis. The latter is pathologic and we see it in diabetes mellitus type I or advanced type II. It is usually triggered by an infection that lowers insulin levels so even less glucose enters the cells. Fasting can never bring you to this situation. Also, do not apply this principles to detox diets, those are not science-based and have nothing to do with the principles I am trying to explain. Here I don’t want to give advice to anybody, I am just trying to explain why intermediate fasting is getting more and more attention. 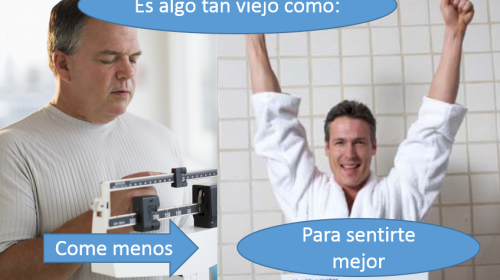 If you choose to try it, it is your own decision, I am doing it and it feel very good. But once again, this post does not substitute medical advice, intermediate fasting is not recommended for children and follow your common sense, if you feel sick stop it, each individual is unique and general advice could not work for you. Whatever you try, explain it to your doctor, most MDs do not pay attention to nutrition, but it is worthy to keep him informed of your decisions. In conclusion we all like to eat, even food we know might be harmful, alcohol, sugar, fried food… I like to compare our bodies to a car, our stomach is the motor which provides energy to the rest of the body. If you force it and run too fast for too long that car is not going to last long but if you have a Gran Torino in your garage that you only use when you need it that car will last much longer. Let’s see now the physiological explanation for ketosis. With a glucose depletion, we could expect a rise in muscle catabolism in order to use glutamine, alanine and other glucogenic amino acids in the gluconeogenesis. However, this is not happening, ketones coming from fat are able to provide sufficient fuel to brain, heart and muscles. This paper explains, how glucose levels do not rise during fasting, see graph below. β-hydroxy butyrate (BHB) as the main ketone raises its concentration and becomes the body’s fuel, while glucose, far from getting to hypoglycemia, lowers its concentration to a constant level. The same study showed an increased heart’s contractibility and metabolic efficiency, and a decrease in oxygen consumption. It seems that electron chain transport ATP production might be optimized when using BHB, but we still don’t know exactly how this works. Some studies have seen an increased production of fibroblast growth factor-21 (FGF21), others describe a broadened oxidative window due to the difference between NADH and Coenzyme Q what produces ATP more effectively. Ketone bodes might reduce as well ROS concentration. The suggested mechanism, explains that coenzyme Q as one of the mayor ROS sources, is oxidized by ketone bodies reducing ROS production. Another proposed mechanism consists on reduced free NAD and NADP in the cytoplasm, rising glutathione levels to deal with H2O2. Ketones raise GABA production, hindering epileptic seizures and increasing neural protection. Mild acidity due to ketosis has shown reduced symptoms in bipolar disorder, bringing patients to euthymia. Memory loss in advanced age. Alzheimer’s disease, double blind study with 152 patients, ketone bodies rise showed improved symptomatology. Parkinson’s disease, 5 patients in ketosis improved symptoms versus 2 control patients. ALS, improved symptoms but no life extension. So that’s all for today. I know, for many of you what I said today is polemic. Dogmas are strongly anchored, but we need to revise them and change them if enough evidence is presented. In science there should be no dogmas, scientist should be prepared to change and to go against the rest. That’s the way many followed, including Miguel Servet, Albert Einstein, Copernicus or the recent Nobel price Dan Shechtman for his work with quasicrystals, even when my idol and model to follow Linus Pauling affirmed: “there are no quasi-crystals, just quasi-scientists.” All them were right, and society’s opinion was wrong. I think the taking home message is, we should leave room for any possibility, and question the strongest dogmas if there is evidence to do so.